Air New Zealand is currently showing some pretty great airfares to the Cook Islands from Vancouver. The flights are down to as cheap as $1078 roundtrip after taxes for flights into Rarotonga (RAR), the capital of the Cook Islands. 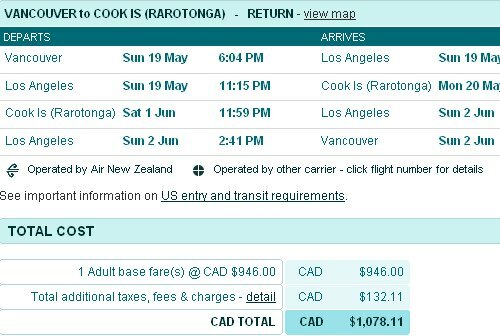 Typically, the bottom price from Vancouver to the Cook Islands is around $1400-$1500 roundtrip after taxes, so this is about 25% cheaper than usual. The cheap flights look to be on limited dates in May and June. 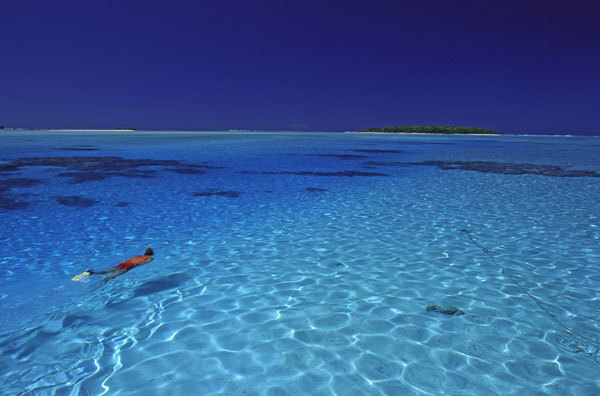 A link to the promo can be found at: http://www.airnewzealand.ca/best-price-to-the-cook-islands - The promo ends Feb 28. An example of a date combo that is showing at the cheap price is May 19 to June 01. May 26 to June 08 is also cheap. Some other cheap ones are from June 02 to June 15, or June 16 to June 29, or June 23 to July 06. And unlike many South Pacific locations of unbelievable paradise (I'm looking at you Bora Bora), the Cook Islands actually have some very reasonable budget accommodations. Have a look at the B&B section of TripAdvisor, which lists some very highly rated properties in Rarotonga from around $45/night. vancouver, yvr, flight deals, air new zealand, pacific islands, rarotonga, cook islands, australasia and polynesia. 2 Responses to "Vancouver to The Cook Islands | $1078 roundtrip after taxes"
Just received this informative email this evening of Feb. 26/13. How about more lead time next time? We have been to the Cooks years ago and enjoyed very much. Just these last couple of days we have talked about the Cooks. @ Al Joys: I think that for a free service, CM is doing an outstanding job. It wouldn't hurt to be more appreciative of the deals he finds for us.